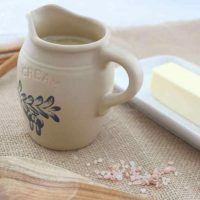 This Keto Sugar Free Buttermilk Syrup is a buttery, salty-sweet breakfast syrup. Also known as golden syrup, it’s great on pancakes, waffles, French toast, crepes, German pancakes, Dutch babies, and probably a million more breakfast foods! This low carb high fat ketogenic version will knock your socks off! 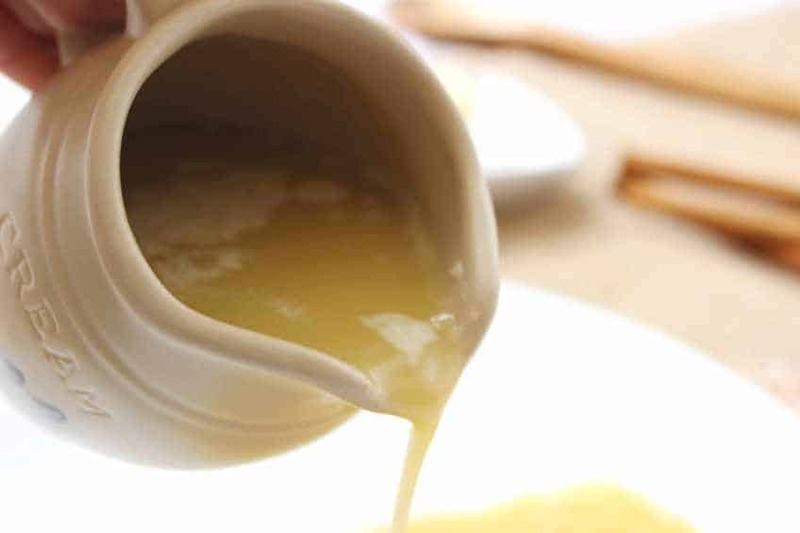 Whether you call it buttermilk syrup or golden syrup, if you’ve had this buttery salty sweet liquid drizzled on pancakes or waffles before, you know that it’s not keto or sugar free. Not in its original form, at least. Lucky for you (and for me, ahem), I’ve finally crafted the perfect keto sugar free buttermilk syrup. Forget that liquid sugar maple syrup stuff. 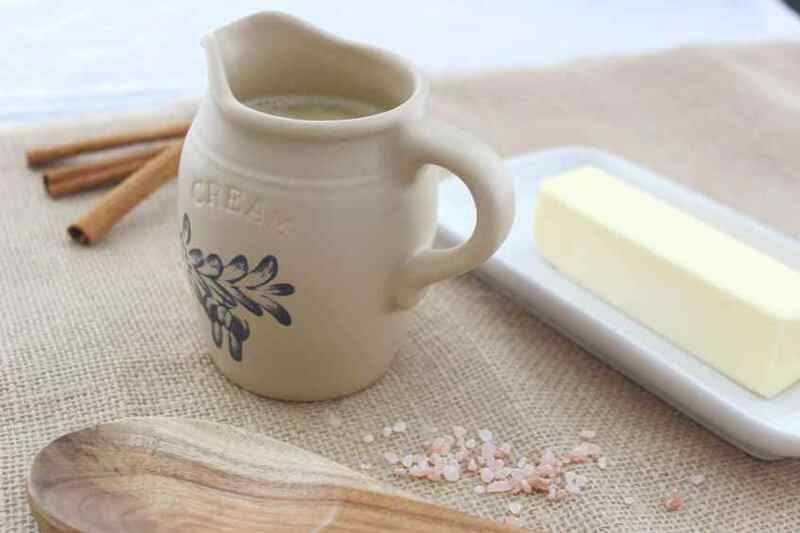 Buttermilk syrup is a unique breakfast condiment. It’s a lot like maple syrup in that it is full of sugar. But a huge portion of it is also butter and buttermilk. Buttermilk syrup was apparently first created by a Utah restaurant called Magleby’s, which is no longer in business. But its legacy lives on in buttermilk pancake syrup! 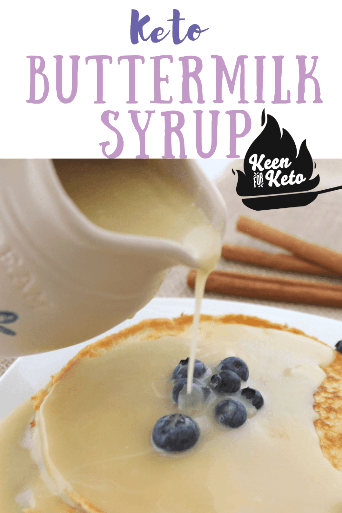 If you haven’t tried buttermilk syrup before, you need to give this keto recipe version a try! If you’re like me and love a salty-sweet combination (oh, kettle corn, how I miss thee! ), this will be right up your alley. In order to make this sugar free, I used stevia (or granulated erythritol) instead of sugar. I also switched the buttermilk to heavy whipping cream and water because of the carbs in buttermilk. 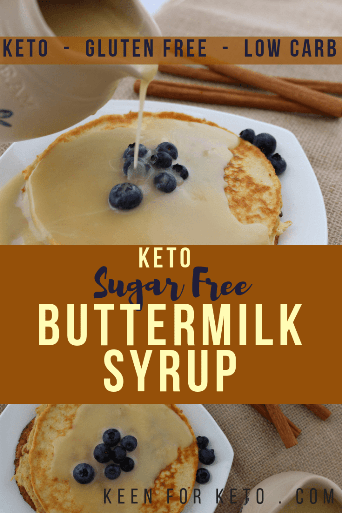 I changed some ratios around, and voila!–the best darn low carb keto sugar free buttermilk syrup you’ve ever tasted! 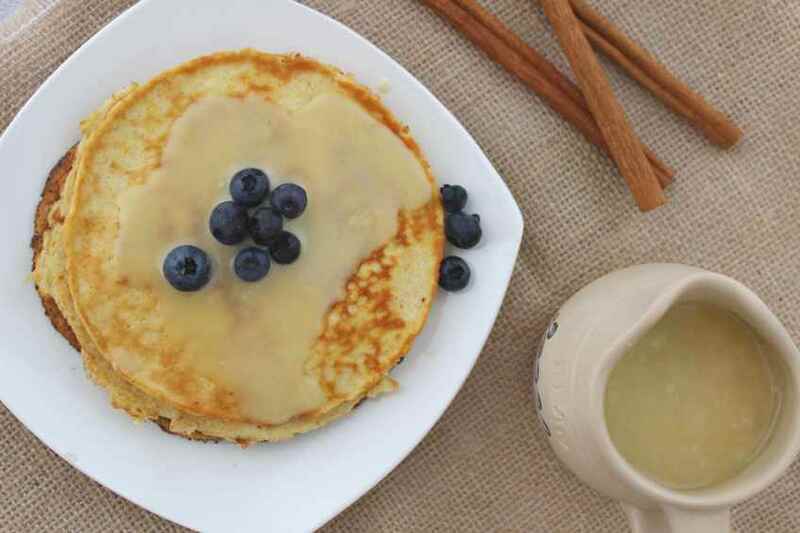 If you need a recipe to try with this syrup, you’ll most definitely want to try it with my keto German Pancakes. This was one of the first recipes I had to turn keto because my family LOVES German pancakes so much. It’s one way I can actually get my kids to eat eggs! As a special treat, I would also suggest plopping a few blueberries on your pancakes after drizzling a good helping of the keto buttermilk syrup on top. Blueberries are a very low carb fruit. So yummy! I chose to make this recipe with both stevia and erythritol so that you could decide for yourself which one you’d like to use. 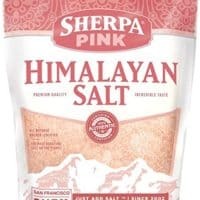 Everyone seems to have their own favorite keto sweetener. I’ve seen plenty of arguments on this point! Personally, I am still trying to decide. A few months ago I would have told you that stevia’s aftertaste was too much for me and erythritol was the best. For a discussion of honey on keto and an amazing creme brulee, go here. The longer I use stevia, the less I notice an aftertaste, and the more I prefer it. It’s cheaper, too, because it’s so much sweeter than sugar that you use a lot less. Which means I save money, but also save space in my pantry! Looking for something more chocolatey? Try these Keto Sugar Free Dark Chocolate Orange Truffles! What are Stevia and Erythritol Made Of? Stevia is also a less processed, more natural sweetener, derived from the stevia plant. The least processed form of stevia is simply made by drying stevia leaves and pulverizing them. Insects don’t like stevia, so no pesticides are necessary. The powdered form of stevia is more processed, but not nearly as much as erythritol. Erythritol is made from (generally) GMO corn. That bothers me. I’m avoiding corn and all other grains and corn-derived vegetable oil, but not corn-derived sweeteners? Corn is a grain! Generally a no-no on the keto diet. Erythritol also has a strange aftertaste that is said to be a cooling effect. Don’t forget to sign up for updates for Keen for Keto! I’ll probably try to transition completely to stevia eventually. I would LOVE to grow my own stevia and dry it like I do with my herbs. 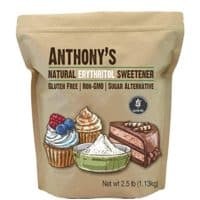 However, I do think erythritol is a great sweetener for beginners because it is immediately more like sugar, meaning until you get used to other more natural sweeteners, this one really has a very close taste to sugar. And the ratio of sugar to erythritol is 1:1, which makes learning the keto diet easier. 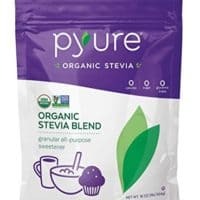 I seem to be the only one in my family bothered by the aftertaste of stevia, so it shouldn’t be too hard to switch our family! Actually, my kids don’t notice a difference between any of the keto sweeteners and sugar, so I’m the last one needing to be convinced! If you’re wondering why I haven’t talked about monkfruit, the reason is simple: it’s much, much more expensive. Hopefully in a few more years as farmers catch up with the demand, we can start using it more! It’s another grain free sugar alternative that doesn’t have an aftertaste or cooling effect. It’s delicious! I do use it in a few recipes that call for small amounts, like my keto German Pancake. Which, by the way, is amazing drizzled with this keto buttermilk syrup! Another issue that you may have with erythritol is crystallization. It doesn’t bother me in the slightest, and I kind of like that crunchy dried glaze texture. Though, for some people this might be the deciding factor between stevia and erythritol or other ketogenic sweeteners. This syrup will definitely crystallize if you use erythritol. There’s an easy fix; microwave your syrup for about 30 seconds or heat it back up on the stove and then stir until the crystals are dissolved into the syrup. With the stevia, you shouldn’t have any crystallization and your syrup will be smoother. If you’re wondering how my kids liked it, they didn’t. They LOVED it. It’s been a long time since I’ve made buttermilk syrup because after doing so much research on keto and the effects of sugar, my mindset has shifted to the point that I sort of cringe when I see liquid sugar being poured over my kids’ food. Especially at breakfast! What is wrong with us humans?! Even before I ever heard of the keto diet and I still thought fat was bad, I made regular buttermilk syrup just to lower the sugar ratio in my kids’ breakfasts! If they were getting more fats, at least they were getting less sugar. Now I know better, that fat is not the enemy! Use either the stevia or erythritol to sweeten this syrup based on your preference. See above section. If you’ve never made buttermilk syrup before, it’s super fun. Two ingredients are vinegar and baking soda, so I’ll let you guess why. I definitely recommend doing it with kids. 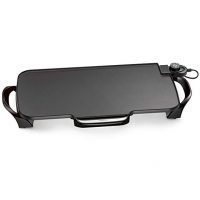 Because of the fun foaming reaction, you’ll need to choose a pan with high sides and plenty of room for your syrup to expand, to avoid having your pancake syrup from spilling over when it expands. Want to know a secret? 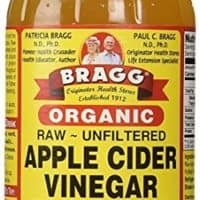 This syrup is so amazing, it can double as a keto glaze! Seriously, pretty awesome! That was a happy lightbulb moment for me. If you want to try it out as a glaze, use my Keto Pumpkin Spice Cream Cheese Danish and skip the glaze instructions for the danishes, using this syrup instead. Yum! In a large, high-sided pan, melt the butter over medium heat. Be sure your pan is large enough to accomodate the syrup as it will foam up when baking soda is added. Add water and either stevia or erythritol. Whisk until the sweetener is completely dissolved. Whisk in cream, vinegar, and salt. Bring to a boil while gently stirring. Remove from heat and gently whisk in vanilla and baking soda. The syrup will begin to foam up at this point. 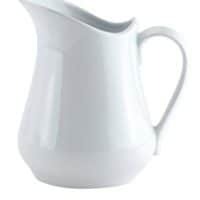 When the foam has receded carefully pour the syrup into a syrup pitcher and serve! Enjoy! 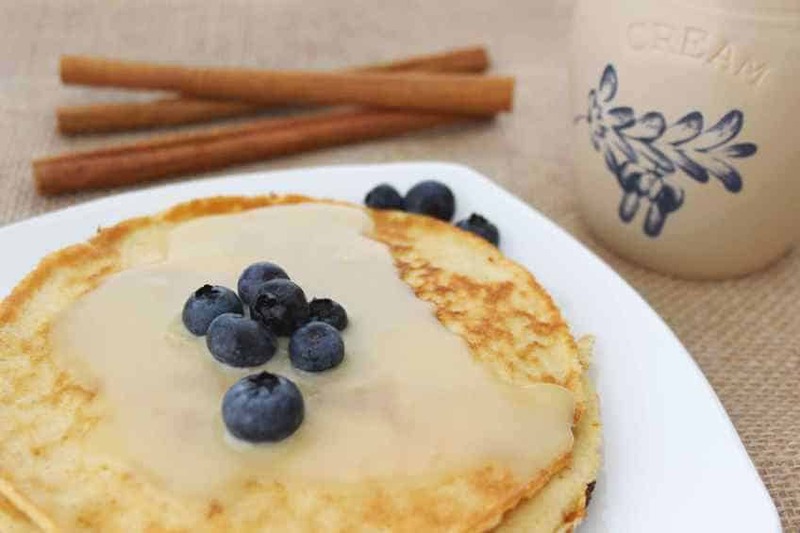 If you use erythritol in this pancake syrup recipe, it will crystallize after cooling. Just reheat and stir till the sweetener is dissolved into the syrup again and serve! Pin this low carb syrup recipe now!